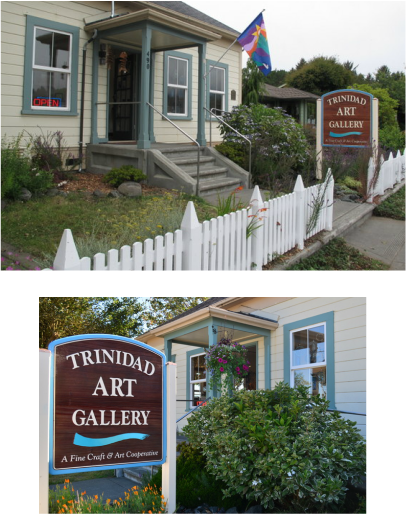 Trinidad Art Gallery is a local artist cooperative gallery and retail shop filled with beautiful, original art and gifts by a group of Humboldt County's finest artists. Our art reflects the beauty of the surrounding ocean, wildlife and redwoods. Here you will find an ever-changing selection of photography, ceramics, textiles, beadwork, woodwork, cards, prints, watercolor, oil and acrylic paintings, jewelry, blown glass, stained glass, sculpture, metalwork, mosaics and fused glass jewelry. There is truly something for everyone, whether a fine art collector, a visitor looking for a treasure to bring home, or local shoppers supporting their community of artists. 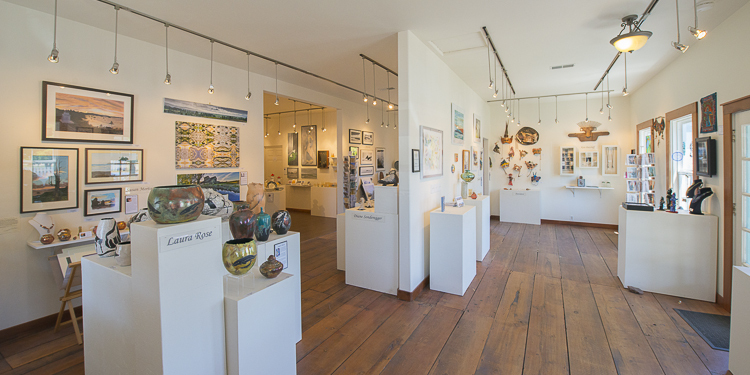 The gallery is located in an historic building in downtown Trinidad, in the heart of the California redwoods, on the Pacific Ocean. Stay at one of Trinidad's cozy Bed & Breakfast Inns, take a walk along one of our beautiful beaches, have lunch at one of our restaurants, taste some great California wine, visit our Redwood National and State Parks, then stop in and see us for unique art and gift ideas in all price ranges. Read more about the history of the gallery. We are located just off US-101, about 5 hours north of San Francisco and 1.5 hours south of the Oregon border. From 101, take Exit 728, Trinidad. At the bottom of the ramp, head west, toward the town and the ocean. Continue on Main Street, which becomes Trinity Street as it curves to the left. The gallery is on your right, just before The Trinidad Bay Eatery restaurant.